Have you been waiting for a taxi to come take you to an airport and it never comes? Or worse yet, you have ordered a car and don’t know where it is. 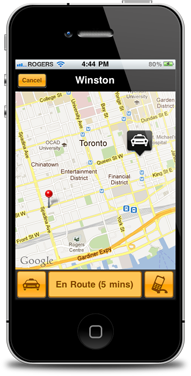 A Toronto based company named Winston aims to change the way you call for a taxi or limo. Launching today exclusively in Toronto, Winston is going direct to cab or car companies and pitching a different way to operate. Instead of high overhead dispatch, which can be hit and miss they are leveraging the customer, GPS and integrated credit card functions to change the game. Sounds a lot like Uber, but Winston’s prime focus is around the business user. The business traveler typically has very different needs than an average traveler. The launch of the app is currently limited to Toronto, Canada, but they will be rolled out in New York, Chicago, Los Angeles and San Francisco by the end of the year. Winston is negotiating agreements currently with international providers and will be in multiple markets in Europe and Asia in 2012. Winston believes it will win out by leveraging broader distribution and greater adoption across more cities. Uber is currently available in 5 cities. “Our customers will be everywhere, we need to be everywhere they are” says Aidan Nulman CEO of Winston. With Winston, rather than picking up the phone, you will be able to order a cab at the touch of a button using the Winston app. While waiting for your ride you can track it approaching via GPS. When you complete your ride, rather than having to reach for your wallet, you just leave the car and the payment is handled via Winston. The payment is tracked via the app, it tracks the pick-up and drop-off location and time spent and charges a credit card on file appropriately. Whether you want either a cab or a limo, a prospective passenger can order either. Limousines obviously come at a premium and a minimum cost of 50 dollars. Winston has already negotiated numerous agreements with cab and limousine companies. Winston has received significant interest from corporations looking to manage employee expenses. One of the key reasons for this is that tax chits can often be abused by employees while traveling. As well, for employees, keeping track of travel expenses is often the last thing they want to do. All in all, this is ideal for a busy business traveler who is getting off a flight to catch a business meeting. This expedites and automates the entire process. Winston derives revenue by taking a percentage of each ride and sees many other potential revenue streams. Winston was founded In January 2011 by Aidan Nulman, Yilun Zhang, and Krista Caldwell. Winston is in The Next 36 program, an entrepreneurship program designed to groom the next generation of entrepreneurs. Winston has worked closely with advisors from Canadian incubator MaRs and other entrepreneurs to get this venture off of the ground. The Winston app is now available on the App Store here, check it out.